MOVE over Rock. You too Mountain. This man has the jump on both of you. Four-time World's Strongest Man winner Brian Shaw has made two of the biggest hulks in Hollywood look like a pair of under-12 football players with a diet so jaw-dropping we're definitely going to run out of superlatives describing it. Dwayne "The Rock" Johnson has regularly gone viral for his famous "cheat day" meals, one featuring a stack of thick pancakes and pizzas and another with 12 slices of sourdough French toast - but his everyday diet is even more incredible. The Baywatch star and former WWE wrestler reportedly clocks in around 4,131 calories a day to feed his 1.96m muscle-clad frame, over two times more than the recommended male daily intake. But that's a couple of snacks compared to what Shaw inhales. The 203cm, 192kg behemoth takes in more than 12,000 calories per day worth of peanut butter, protein shakes, beef and more peanut butter to achieve the status of the strongest man on Earth. "I'm just eating to be the strongest human being on the planet," said Shaw, in a YouTube video as he highlighted his first meal consisting of cereal, eggs and peanut butter. "This meal, even though it's got eight eggs, it doesn't really fill me up. I get through it pretty quickly and then I'm hungry again." Shaw said the eating side of his career is by far the hardest, shrugging off back-breaking dead lift training as "fun". "Eating is the hard part. It's constant - you don't ever stop from the time you wake up you eat until you go to bed. Then I wake up in the morning and the first thing I do is eat and do it all day again. "People think the training is the hard part, it's not really. That's fun, I can get loose and do what I want to do. I only get to train for a few hours, maybe during the day." The man-giant explained his sixth meal - a huge feed of pizza takeaway and soft drink - was suggested by his dietitian to eat before big training days. On other days, the 35-year-old eats a giant plate of beef, potatoes and asparagus instead. 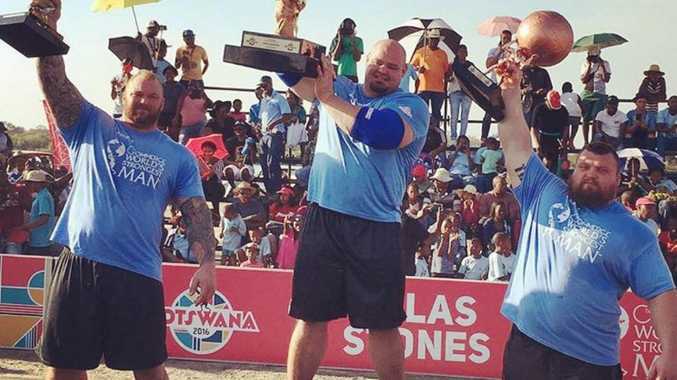 Shaw defeated famous strongman and actor Hafthor Bjornsson in a strongman competition held in Botswana last year. Bjornsson, who plays Gregor "The Mountain" Clegane on HBO's Game of Thrones, stated his life goal is to win the World's Strongest Man competition, posting his daily intake and training program to his Instagram last year.